Psychogeography was defined by its founder, the Frenchman Guy Debord, as “the study of the … effects of the geographical environment … on the emotions … of individuals”. It can also be taken to be an exploration, often literally, on foot, of what it is about a place that evokes a sense of place. In Blackfriars, that is history: inescapable; and inextricable from that of London as a whole. History, or, as Peter Ackroyd put it, “chronological resonance”, or “time … moved or swayed by some unknown source of power”. For it is here that London may be said to have begun, nearly two thousand years, or a hundred generations, ago. Here, at the lowest point on the Thames at which it was fordable and bridgeable. Here, on the comparatively high, dry and defensible ground around Ludgate Hill (and, a little to the east, Cornhill). Here, where the Romans founded Londinium, on the damp maritime frontier of their vast continental empire, with easy access to the sea, and the overseas dominions, and yet at the same time close to the hinterland and heart of England. Here, on the “lost” Thames tributary of the Fleet, where all those centuries ago a Roman barge sank with its fifty-ton cargo of Kentish building stone still aboard. Here is why London is where it is. … and the land was given over to allow construction in 1278 of the Blackfriars Priory, one of the largest and most important monastic houses in the country. In 1322, a large number – possibly hundreds – of needy poor people were reportedly crushed to death in a rush to beg alms at the priory gates. Remarkably, given its later history, precious fragments of the stonework fabric of the priory still survive, and can still be seen and touched. Nothing remains, though, at least above modern ground level, of the Parliament Hall, where, in 1529, Henry VIII appeared before the Legatine Court to petition for the annulment of his marriage to Catherine of Aragon, so as to enable him to marry Anne Boleyn. The ultimate failure of the negotiations was to have far-reaching consequences for the church, and indeed for the entire country, of England, not the least of which was the Dissolution of the Monasteries, including that of the Blackfriars, which took place in 1538. After the dissolution of the Blackfriars, at the beginning of what we now consider to be the post-Medieval period, its properties and lands were made use of as the King saw fit. The priory church came to be owned by his Master of the Revels, Thomas Cawarden, and part of it used as his Office. A little later, in 1576, the Great Hall came to be adapted for use as the first Blackfriars Theatre; and, in 1600, the Parliament Hall, the scene of the aforementioned earlier real-life high drama, the second Blackfriars Theatre. The second Theatre came to be owned by Shakespeare’s company, by then known as the “King’s Men”, in 1609, after the incumbent troupe of child-actors gave grave offence to the King, James I, during one of the performances they put on there in 1608. Shakespeare evidently wrote some of his later plays, including “A Winter’s Tale”, “Cymbeline” and “The Tempest”, specifically for performance in the indoor arena of the “Second Blackfriars”, incorporating noticeably lengthier musical interludes, presumably designed to keep the audience amused while the wicks on the lighting-candles were trimmed midway through the performance. In 1613, according to the surviving Deed of Conveyance, he bought for then princely sum of £140 a “dwelling house or Tenement … within the Precinct, circuit and compasse of the late black Fryers London … ; part of which said Tenement is erected over a great gate …”, presumably as an investment. What may once have been part of the cellar is preserved in what is now the public house known as the “Cockpit”. Essentially the entirety of Blackfriars, and indeed the greater part of the City of London, was then burned down during the Great Fire of 1666 (the theatre by then already having been closed down during the Civil War of 1642-51). The friendless church of St Ann was never rebuilt, and the parish was united with that of St Andrew. Most of what was rebuilt was burned down again during the Blitz of the Second World War, much of it during the so-called “Second Great Fire of London” on the night of 29th/30th December, 1940. To walk in Blackfriars is to walk in history. More than anything, it is to walk in the footsteps of Medieval monks and lay persons; and to inhabit, however briefly, their spiritual as well as their physical world. 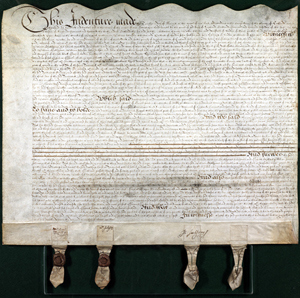 This entry was posted in London History, Medieval, Post-Medieval, The Great Fire of London, Theatrical London, Wartime London and tagged Anne Boleyn, Baynard's Castle, Blackfriars, Blackfriars Priory, Blackfriars Theatre, Catherine of Aragon, Dissolution of the Monasteries, Henry VIII, James I, King's Wardrobe, Legatine Court, Shakespeare, St Andrew-by-the-Wardrobe, St Ann, Thomas Cawarden on September 10, 2018 by Bob Jones - The Lost City of London. On this day in 1613, the original “Globe” play-house on Bankside in Southwark burned down, after sparks from a theatrical cannon set its thatch alight during a performance of Shakespeare’s “Henry the Eighth”. It was rebuilt in 1614, before falling into disuse sometime around 1642, when the performance of plays was banned by an Act of Parliament forced through by the Puritans; and was finally demolished in 1644, again by order of the Puritans. “Now, King Henry making a Masque at the Cardinal Wolsey’s House, and certain Cannons being shot off at his entry, some of the Paper, or other stuff, wherewith one of them was stopped, did light on the Thatch, … and … kindled inwardly, and ran round like a train, consuming within less than an hour the whole House to the very ground. This was the fatal period … wherein yet nothing did perish but wood and straw … ; … one man had his breeches set on fire, that would perhaps have broiled him, if he had not by the benefit of a provident wit put it out with bottle ale”. “[I]t was a great marvaile and fair grace of God, that the people had so little harm, having but two narrow doors to get out”. The 400th anniversary of the fire, in 2013, was marked by the reconstructed “Globe” by a series of events on the theme of “Shakespeare on Fire”. This entry was posted in Contemporary accounts of events, London History, On this day, Post-Medieval, Stuart, Theatrical London and tagged Bankside, Edmund Bacon, Globe, Henry Wotton, John Chamberlain, Shakespeare on June 29, 2018 by Bob Jones - The Lost City of London. On this day in 1601, Robert Devereux, the 2nd Earl of Essex, allegedly led an unsuccessful attempt to overthrow the then Queen, Elizabeth I, and her court, a treasonous act for which he was later tried, convicted and, on February 25th, beheaded (at the Tower of London). Four of his supporters, Sir Christopher Blount, Sir Henry Cuffe, Sir Charles Danvers and Sir Gelli Meyrick, were also executed, on March 5th, although all the others, including the Earl of Southampton, were spared. Essex had earlier been publicly disgraced and politically and financially ruined by being placed under house arrest and removed from his office as Lord Lieutenant of Ireland, for failing to execute Elizabeth’s orders to him to suppress an insurrection in that country (led by the Earls of Tyrone). It was in Essex House – on the Strand – that he hatched his crackpot plot. On February 7th, 1601 he took a boat from Essex Steps to the “Globe” in Southwark to bribe Shakespeare’s “Lord Chancellor’s Men” to stage a special performance of “Richard II”, overplaying the scene in which the King was deposed, with a view to encouraging support among the watching crowd. The plan began to backfire on the morning of the fateful following day, February 8th, when four of the Queen’s men arrived to arrest him, and he was forced to take them hostage (one of them being Thomas Egerton, the 1st Viscount Brackley, the Lord Keeper). However, he decided to carry on regardless, and, with some two hundred followers, marched from Essex House upon the City. When they arrived at the gates, they met with a hostile reception, having by that time already been denounced as traitors (by Robert Cecil, the 1st Earl of Salisbury, the Secretary of State). At this, most of Essex’s supporters deserted him, and he was forced to return to Essex House, where after a short siege, during which he attempted to destroy any evidence that might incriminate him, he found himself forced to surrender to the Queen’s men (under the Earl of Nottingham). This entry was posted in 17th Century London, London History, On this day, Post-Medieval, Rebellious London, Tudor and tagged Earl of Essex, Earl of Salisbury, Earl of Southampton, Elizabeth I, Essex House, Globe, Robert Cecil, Shakespeare, Tower of London on February 8, 2018 by Bob Jones - The Lost City of London. 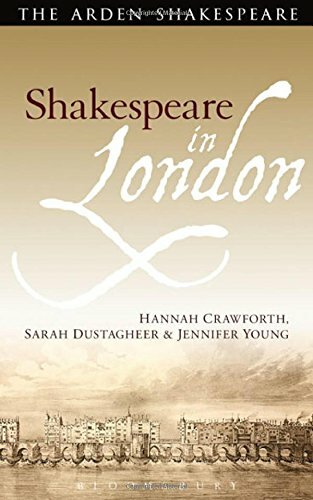 “Shakespeare in London” by Hannah Crawforth (Lecturer in Early Modern Literature at King’s College London), Sarah Dustagheer (Lecturer in Early Modern Literature at the University of Kent) and Jennifer Young (Teaching Fellow in English Literature (1590-1700) at the University of Leeds), published by Bloomsbury in 2014 (ISBN (PB): 978-1-4081-4596-8). Available from your friendly local book-shop (or faceless tax-avoiding online giant). Price £16.99 or less. The core contention of this fascinating, thoughtful and thought-provoking book, akin to Ackroyd’s, is that Shakespeare’s adopted home of London informed, and indeed was the nourishing womb of, all of his writing. He did not often directly reference it in his works. However, he may have indirectly referenced the violence of Tyburn in “Titus Andronicus”; the political machination of Whitehall in “Richard II”; the class distinction of the Strand in “Romeo and Juliet”; the legal machination of the Inns of Court in “The Merchant of Venice”; the religiosity of St Paul’s Cathedral in “Hamlet”; the madness of Bedlam in “King Lear”; the misery of imprisonment for debt in the King’s Bench Prison in Southwark in “Timon of Athens”; and the strange new world of the “cabinet of curiosity” on Lime Street in “The Tempest”. And the rich variety and cosmopolitanism of one of the first true World Cities in the form of an ever-present back-drop. The City was the World, in Microcosm. Moreover, he set one of his most famous scenes here, in Ely Palace: that in “Richard II” in which John of Gaunt utters in his dying speech the immortal words: “This royal throne of kings, this sceptr’d isle,|This earth of majesty, this seat of Mars,|This other Eden, demi-paradise,|This fortress built by Nature for herself|Against infection and the hand of war,|This happy breed of men, this little world,|This precious stone set in the silver sea,|Which serves it in the office of a wall,|Or as a moat defensive to a house,|Against the envy of less happier lands,|This blessed plot, this earth, this realm, this England”. This entry was posted in London History and tagged Shakespeare on May 28, 2015 by Bob Jones - The Lost City of London.